It’s getting to be that time of year again when Matilda rotates around the house throughout the day seeking out the sunny spots. 38 degrees this morning. Yikes! 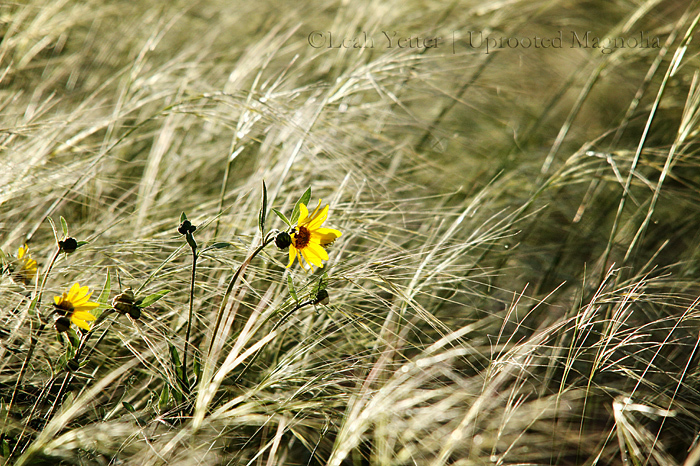 Needle and thread grass and mini sunflowers in June are a sure sign of a wet summer. Can you feel the breeze blowing through the grass as the scent of sage whirls all around you? That’s exactly how it was in the moment I took this image. It’s just another beautiful day in paradise here in wonderful Wyoming. I wish you all a beautiful weekend my friends! My heart is filled with hope as I got word this morning that a family member who was in a horrible car accident is doing well through her surgery. With a broken pelvis and dislocated leg, she is in for a long recovery. And so, with the help of her wonderful network of friends and family, her 2 little boys and dedicated husband, she WILL pull through. I love you Christine! Matilda and I have been in a creative slump these last couple of weeks. It’s okay, it happens occasionally. She enjoys her 12 hour naps in the guest bedroom while I work around the house and yard, schedule photo shoots, and learn how to drive my new-to-me mountain bike. I have big projects lined up for this summer and I’m hoping my bike will come in handy. Anyway, Tilda and I are doing good and hope the same goes for you! I took this image of the Great Horned Owl and her Nestling exactly three weeks ago. I’ve been checking on them every other day or so since then and they’ve been hanging out and stretching their wings. I guess momma has been teaching baby to fly for some time now. I knew the time was drawing near. I’ve gone to the bluff every day this week. The nest is empty. It has been quiet there all week. I’d say their timing is good because the river is up so high and is raging past the bluffs. The nestling is now a young owl and is flying the skies with ma and pa. I do hope they will come back and reuse this nest. Or at least stay around the area. Matilda Badilda gets excited when cameras and tripods are by the door. But really she’s just impatiently waiting for me to fill her food bowl before I go out shooting. Silly Tilly. Matilda loves to unplug and go for a walk. She always seems to say “follow me!” She loves rolling in the sand but I am anxious for grass to grow. Hope you take a moment to unplug and take a walk outside. That’s where I will be all day today… until the rain comes. Happy Tilda Tuesday! Even though her momma has been super busy these last few weeks, Matilda patiently (or rather impatiently) waits for her favorite lap to be still. This is a daily occurrence. I wish I could be as relaxed as she is on this sunny window sill. Matilda was appalled that this photo shoot was about a precious 6 month old baby and not of her. Silly Tilly. I’m still trying to get the perfect a shadow portrait of my girl. Her head is turned too much here because she’s looking at my lap, ready to curl up. But the light that shoots in at sunset is beautiful and when she perches on the arm of the couch, it cast a neat shadow image. It’s a work in progress though.